Every afternoon, as the kids and I walk home from school we pass by this lovely little statue of Mary. One day, back when the kids were much younger, one of them asked, "Who is that lady?" 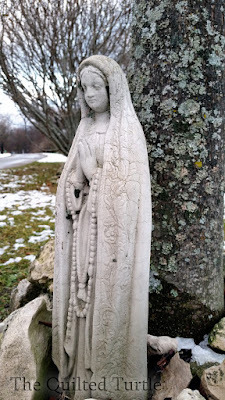 "It's Mary," I answered, intending to explain why Mary was important enough to merit a statue of her in one's yard, but before I could, the kids started serenading her with "Mary had a little lamb." I still smile every time I walk by that house. Needless to say, since then, that misconception has been cleared up.